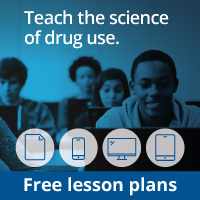 The National Institute on Drug Abuse (NIDA), in collaboration with the National Institutes of Health (NIH) Office of Science Education, has developed interactive, science-based supplements for use by high school students and teachers (grades 9-12) in the science classroom. The Brain: Understanding Neurobiology Through the Study of Addiction includes a high school curriculum in print plus an interactive CD-ROM. These supplements provide current, research-based information on various aspects of drug abuse and addiction, including neurobiology, behavioral components, and treatment. The Brain: What's Going On in There? Positron emision tomography (PET) images identify anatomical regions and functions of the brain - basic brain physiology. Illustrations and video show how neurons relay information through electrical and chemical signals - neurotransmission. Data analysis reveals how drugs exert their effects and can alter the biology and chemistry of the brain. Animal experiments demonstrate the environmental, behavioral, and social influences on drug abuse and addiction. Drug Addiction Is a Disease - So What Do We Do About It? Case studies display treatment options and success rates for treating the chronic illness of drug addiction. NIDA. "The Brain: Understanding Neurobiology Through the Study of Addiction." National Institute on Drug Abuse, 1 Mar. 2010, https://www.drugabuse.gov/publications/brain-understanding-neurobiology-through-study-addiction. NIDA. The Brain: Understanding Neurobiology Through the Study of Addiction. National Institute on Drug Abuse website. https://www.drugabuse.gov/publications/brain-understanding-neurobiology-through-study-addiction. March 1, 2010.